I am going to post a series of posts about National flowers (floral emblem) of different countries starting with countries with first letter A. 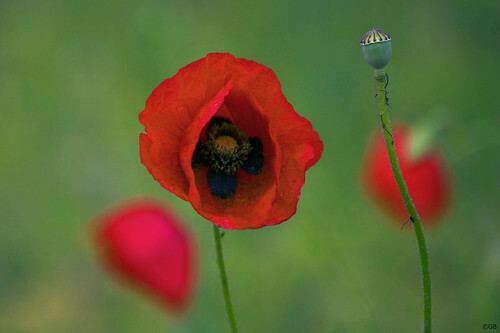 The floral emblem of Albania is the red and black poppy. The poppy can be found everywhere in this Mediterranean country, and are recognized for their beauty, medicinal value, and seeds. Erythrina Cristina Galli was adopted as the National flower of Argentina on December 2, 1942. Erythrina is found naturally along water courses, in swamps and wetlands. Because of the red beauty of this flower it is also grown in urban settings such as parks and gardens. Basically the Erythrina is a South American tree, with carmine red flowers and a crooked trunk which locally is known as Ceibo, Sebo or Bucar. Golden Wattle (Acacia pycnantha) is Australia’s national flower. The Golden Wattle blooms in spring, – beginning September – in Australia, with large fluffy, yellow, sweet smelling flower heads. Each Golden Wattle flower head is a bunch of many tiny flowers. Acacias are popularly called Wattle. Edelweiss (Leontopodium Alpinum), the Nationnal flower of Austria, is one of the best-known European mountain flowers. Belonging to the sunflower family, these star-like flowers are short lived perennials. Apart from being Pictured on Austrian euro coins, the flower has been used traditionally in folk medicine as a remedy against abdominal and respiratory diseases. The flower is also called Floarea Reginei (Queen flower). This entry was posted in National Flowers, Travel - Places. Bookmark the permalink. Good info regarding flowers worldwide.